Kate Z. Graham | Fafinski Mark & Johnson, P.A. Kate Graham is an Associate in the Agriculture and Trusts & Estates practice groups and uses her experience working on farms and with farmers to serve her clients’ legal needs. She handles a variety of estate planning, farm succession planning, elder law, and agriculture and food law matters. Kate works hard for her clients and advocates strongly for their interest. She enjoys getting to know her clients, both personally and professionally, and building relationships with them founded on trust and integrity. Kate received her Juris Doctorate from William Mitchell College of Law. 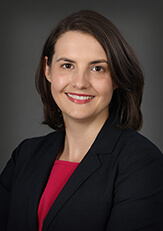 In addition, Kate has formal training in agriculture and food law from the University of Arkansas, Fayetteville. During this time, she also served as an adjunct professor teaching a “Wills, Trusts, & Estates Drafting Lab” for law school students interested in learning the practice of estate planning and probate administration. The focus of her academic work was to develop strategies for farm families who are navigating the process of passing their farm to the next generation, whether that is natural heirs or unrelated successors. Prior to joining FMJ, Kate clerked for the Minnesota Court of Appeals for the Honorable Judge Larry Stauber for two years before practicing for three years doing estate planning, elder care law, and probate administration at a firm in Richfield. Collaborative Community Law Initiative, Treasurer and Board Member (2015 to Present) In collaboration with Mitchell Hamline School of Law, operating Minnesota’s first lawyer incubator serving low-income clients. Outside of work, Kate enjoys spending time in the outdoors with her husband and dog. She likes gardening, hiking, camping, and fishing (although she still won’t bait her own hook!). When indoors, Kate loves cooking (and eating), reading, knitting, and spending time with her cats. She travels whenever she can, and her favorite place to visit is France. Someday, she wants to learn how to play the banjo.